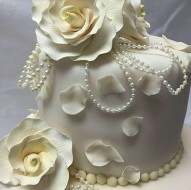 Do you want to learn more about our extensive range of sugar craft supplies or order your perfect wedding cake? Contact us by phone, email or by calling in, we will be happy to discuss your requirements. Recently got married and had no idea where to start! Gill and the team assisted me with arrangements for my wedding in Cyprus and the evening reception at Kenwood Hall. Great support throughout and made my special day one to remember! Thank you! wedding cake in the last year please vote for us!